Land cleared to make way for United Cacao’s 2,000 hectare (5,000 acre) plantation. Photo by Mongabay. This post is part of WRI’s blog series, Zooming In. The series uses the Global Forest Watch platform to explore threats, changes and opportunities in forests around the world. This post analyzes the effects of one cocoa producer on Peru's forests. For more information on the link between chocolate production and rainforests, check out our related blog post. United Cacao, a publicly-traded, commercial producer of the raw material that goes into chocolate—its symbol on the London Stock Exchange is CHOC—has earned some unwelcome attention recently for its large-scale clearing of trees in the middle of the Peruvian Amazon. Reports about the clearing of more than 2,000 hectares (5,000 acres) of trees in Intact Forest Landscapes first emerged from Mongabay, then at outlets including Confectionary News, Ojo Público and The Guardian. Intact Forest Landscapes are the world’s last remaining large, undisturbed forests, containing no signs of fragmentation by infrastructure and logging such as roads, mining and oil and gas development. The Amazon is the world’s largest remaining continuous Intact Forest Landscape. As shown on the Global Forest Watch map below, this controversial patch of land is a dot in the jungle in Peru’s Loreto region. However, this area holds some of the most carbon-rich and biodiverse forest on the planet and is part of one of the last vast expanses of untouched ecosystems in the world. United Cacao cleared 2,000 hectares (5,000 acres) of land near Iquitos, Peru, the world’s largest city inaccessible by road. Graphic by Global Forest Watch. 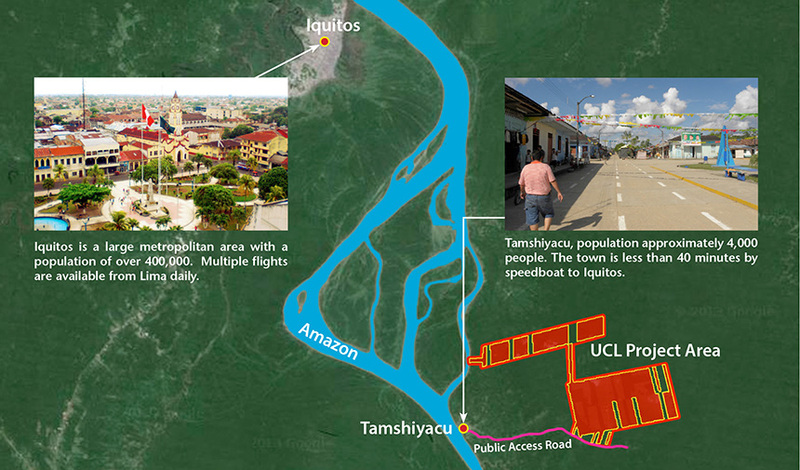 Located just outside Iquitos, the world’s largest city inaccessible by road (only by airplanes and boats), and connected to the small town of Tamashiyacu, the United Cacao plantation is far from the public eye. United Cacao officials claimed this would be the largest cacao plantation in the world. They also said they would practice sustainable agriculture on what was previously degraded and farmed land. 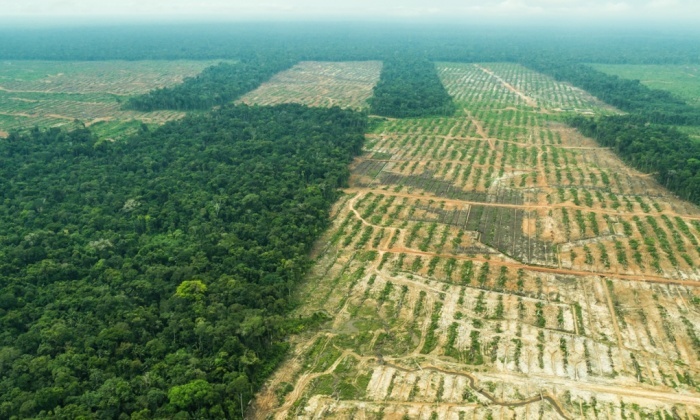 However, Mongabay, researchers at the Amazon Conservation Association, and researchers at the Carnegie Institution for Science used satellite imagery, laser scans and GFW data to show how the patches were carved out of an Intact Forest Landscape, which is now visibly degraded. It’s also possible to see the clear-cut trees strewn across the unplanted land. Clear-cut trees strewn across land slated for United Cacao plantation. Photo by EIA. United Cacao clearing overlaps with Intact Forest Landscape. Light green denotes degraded forest; dark green is Intact Forest Landscape; pink is tree cover loss. Satellite image of area cleared for United Cacao plantation. Graphic by Global Forest Watch. Peru’s government initially ordered United Cacao to halt operations, as environmental impact assessments and land use rights were called into question. Yet, a local court recently ruled the clearing to be legal, which allowed United Cacao to resume clearing and planting. This suggests that as cacao production expands in Latin America, and companies like United Cacao set their sights on fertile forested regions, such activities could become a trend. This may put United Cacao—and other operators if they follow in United Cacao’s footsteps—at odds with a growing push toward corporate zero-deforestation commitments from major commodity suppliers and buyers. More than 60 percent of palm oil buyers have promised not to buy oil associated with deforestation, and other industries are quickly following suit. Some scientists have already warned investors that buying from United Cacao would be inconsistent with sustainable investment or procurement policies. This doesn’t mean that all land is off limits for agriculture. New research is increasingly showing how companies can avoid further deforestation by expanding sustainable agriculture onto already degraded lands. A recent study mapped 125 million hectares globally (309 million acres, or an area almost as large as Peru itself) of low-carbon, degraded land that is potentially suitable for agriculture. Under the right conditions, expanding cacao production could be diverted toward some of this land. This would prevent clearing of carbon- and biodiversity-rich forest as well as increase agricultural productivity on degraded land, resulting in climate mitigation, biodiversity conservation and livelihood protection. However, United Cacao is currently acquiring more land for its operations—more than 4,000 hectares (nearly 10,000 acres) by the end of 2015—and plans to add 1,250 hectares (3,000 acres) to its 2,000-hectare (5,000-acre) plantation by the end of 2016. For its existing operations, sustainability may already be beyond reach. But for any future expansion, the company should seek out (or swap for) available degraded land rather than encroaching upon more carbon-rich forest. Map from United Cacao website shows land area designated for cacao plantation. Lower rectangle denotes already cleared area; upper denotes planned clearing. Graphic by United Cacao. Holding companies accountable with near real-time data is increasingly important to preserving pristine forests. Improving transparency around destructive activities helps set high standards for good corporate behavior in the region and beyond. FORMA and Terra-i alerts show near real-time progression of forest clearing. Graphic by Global Forest Watch. 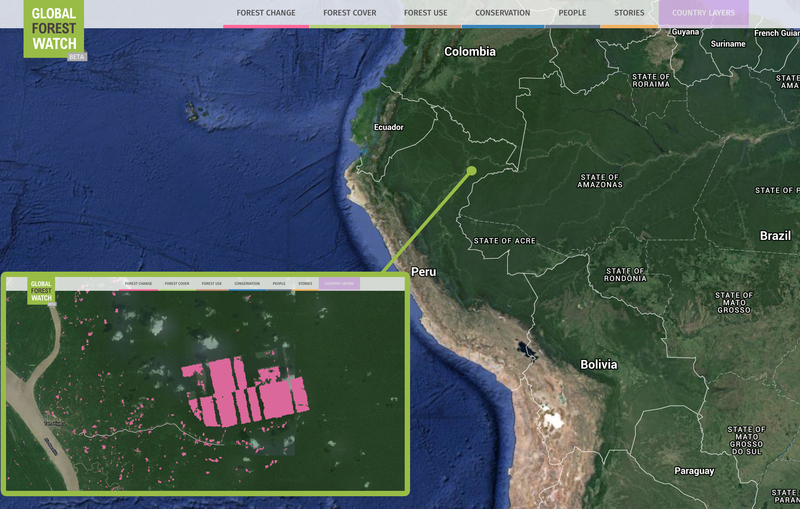 As the story continues to unfold, you can remotely monitor changes on the ground using FORMA Alerts and Terra-i data via the Global Forest Watch platform. LEARN MORE: To follow the full story, scroll through the interactive timeline below, or click here.